It’s the middle of summer and that often entails no one wanting to cook in attempts to keep cool and not add more heat to the house by turning on the oven. 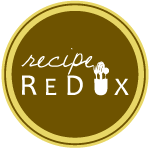 This month’s recipe redux theme uses some form of cooking rather than the oven: slow cooking, pressure cooking, insta pots, etc! My bff in this situation is the slow cooker because it means low and slow cooking that produces flavorful and tender meals that are comforting and satisfying, even in the sultry summer! This recipe is almost a 2-ingredient meal. If you have the salsa mixture already on hand in your fridge then you can just plop some in the pot with the chicken and be done. If you don’t have a fresh jar of homemade salsa, not to worry, everything gets blended briefly and poured in so it’s still little prep work- something that can be done pretty thoughtlessly at night after a long day, or in the early am before you head out the door. I do love this salsa- on a side note! It’s so fresh and flavorful with a little kick of heat and extra flavor from the chipotle peppers! It’s great to make up ahead of time and use for various other recipes! In a blender or food processor, blend all the ingredients together- except the chicken, tortillas, and fixin’s (Rotel through the lime). Blend until well combined. Pour the salsa into the bottom of the slow cooker pot. Place the chicken breast on top. Set on low for 6-8 hours. Shred with two forks and serve on whole grain tortillas with desired fixin’s. As with many of my recipes, you can adjust the amounts of ingredients to suite your taste and what’s available in your house. If you have half an onion to use and won’t likely use it later in the week for another recipe, by all means, throw it all in the blender for the salsa. If you only have 3 cloves of garlic, no big deal! Use what you have and don’t stress!